The euro today rallied higher against the US dollar in the early Asian session following yesterday’s dovish FOMC minutes and Fed comments. The single currency soon headed lower as the US dollar staged a rebound boosted by the risk averse market sentiment as the optimism around the US-China trade talks faded. The EUR/USD currency pair today dropped from an Asian session high of 1.1570 to hit a low of 1.1516 in the American session. The currency pair rallied slightly on the back of yesterday’s dovish FOMC minutes, which confirmed the Fed’s bearish stance. The pair quickly headed lower as the US dollar staged a comeback and rallied higher as tracked by the US Dollar Index, which hit a high of 95.42. The pair’s decline was further extended by the release of the weak French industrial output data for November by Insee. The upbeat Italian retail sales data released by Istat came in above expectations, but could not lift the currency pair. The release of the latest European Central Bank account of monetary policy meeting confirmed the bank’s dovish outlook and had a muted impact on the pair. The release of the US initial jobless claims data by the Department of Labor, which came in below expectations, also contributed to the currency pair’s decline.However, the continuing claims print was higher than expected. The currency pair’s short-term performance is likely to be influenced by the Fed Chairman Jerome Powell‘s speech scheduled for 17:00 GMT today. 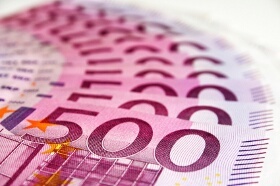 The EUR/USD currency pair was trading at 1.1519 as at 15:22 GMT having dropped from a high of 1.1570. The EUR/JPY currency pair was trading at 124.54 having fallen from a high of 125.04. If you have any questions, comments, or opinions regarding the Euro, feel free to post them using the commentary form below.